Will Robo Auto-Rebalancing Protect Your Assets In A Bear Market? One of the automated features of many robo-advisors is automatic portfolio rebalancing. Therefore, it is prudent to see if auto-rebalancing adds value in a bear market. Let’s assume you are 25-40 years old and you have signed up for an automated online management service. 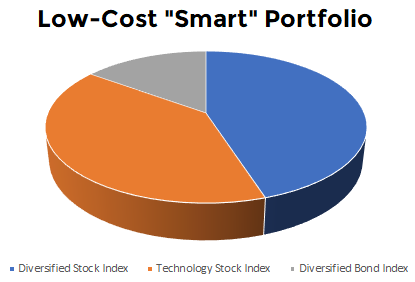 You answer some questions about your age, time horizon, and risk tolerance and the “intelligent” service places you in an allocation that is heavily weighted toward stocks, similar to the allocation shown below. An allocation comprised of a diversified stock index (45% in SPY), a diversified technology index (40% QQQ), and a diversified bond index (15% VBMFX) lost 50.51% between the bull market peak in March 2000 and the bear market bottom in October 2002. If the same portfolio was automatically rebalanced every three months, performance dropped to a loss of 59.26%. Therefore, it is possible the robo advisor feature of auto-rebalancing will harm you rather than help you in a devastating bear market. Without an exit strategy, the loss on the $1,000,000 portfolio would have been $505,075 in the no-rebalancing scenario. The automatic-rebalancing scenario would have resulted in a loss of $592,584. The difference between the two scenarios is $87,508. This hypothetical illustration shows the potential downside of both (a) buy-and-hold-and-hope and (b) buy-and-hold-rebalance-and-hope; it also shows the importance of principal protection strategies relative to a primary focus on low fees. Michael Edesess, chief investment strategist at Compendium Finance, suggests that rebalancing is no better or worse a strategy than buy-and-hold.... He argues that the academic investment community, in claiming an overall financial advantage for rebalancing, is misleadingly selective with the related research data. What mathematical research on the subject shows, he says, is that an outcome in which rebalancing exhibits an advantage is but one possibility in a range of possible outcomes governed by the laws of chance. If one looks at an average of all the possible outcomes, he says, it is clear that neither strategy has an advantage. Earlier research cited by Dr. Edesess, by Andrew Wise, a former actuary with a global consulting firm, also found no clear advantage between the two strategies. Mr. Wise, whose paper on the subject was published in the British Actuarial Journal in 1996, says he and Dr. Edesess are in agreement. There are other skeptics about the wisdom of rebalancing as well. Michael Falk, a chartered financial analyst, author and partner at Focus Consulting, says rebalancing makes two false assumptions: One, that all securities are cyclical and regress to a mean. “Some securities fall and can’t get back up,” Mr. Falk says. And two, that all regressions to the mean take the same amount of time. “Hence, rebalancing cannot be assumed to always add value,” he concludes. Diversified portfolios and rebalancing are not new concepts and have been used by old school Wall Street firms for decades. As covered in a separate FAQ, a diversified pie chart of growth ETFs and/or mutual funds will not necessarily save you in a bear market.